Exhibitions will be one of the most important activities of the Center for Chinese Art. Exhibitions will be arranged and organized to provide more opportunities for students to learn about both Chinese art and culture. They will showcase the high-quality and unique production of internationally renowned artists, William Paterson faculty, and student artists. The Center will curate Chinese art exhibitions and display them in the Ben Shahn Center for the Visual Arts and Power Art Center galleries of William Paterson University in New Jersey, and arrange for these exhibits to tour other universities in America and China. Subsequently, an exhibition catalogue with an introduction to the exhibition themes and interpretive essays on the history, culture, and arts of the period or region will be published in both English and Chinese. Conferences, lectures, and demonstrations will be presented and receptions will be hosted during these exhibitions. The Chinese city of Yinchuan in the northwestern province of Ningxia may not be familiar to the Western art world, but it is the home of movable type printing - one of the four great inventions of Ancient China known throughout the world. In 1991, the original copy of the Auspicious Tantra of All-Reaching Union considered to be the earliest extant example of a book printed using wooden movable type during the Western Xia Dynasty (1038–1227), was discovered in the ruins of the Baisigou Square Pagoda in Helan County, Ningxia Province, and is currently held at the Ningxia Institute of Archaeology in Yinchuan. In view of the historical significance of this city, it therefore becomes abundantly clear why we are calling our current exhibition Yinchuan Conversation: Sino-US International Printmaking Art Exhibition. Yinchuan, the ancient capital of the Western Xia Dynasty and an oasis beyond the Great Wall of China, is a city of historical renown, situated at the main route of exchange between the cultures of the east and the west. The city witnessed the bitterest of clashes between the east and west civilizations and nations, and made great contributions towards cultural and economic exchanges between the east and the west. With her mighty and profound cultural traditions, Yinchaun embraces the cultural calling to nurture modern cultural development and communication. On behalf of printmaking artists from the United States, I would like to express our heartfelt gratitude towards our hosts for their generosity in creating this exhibition and thereby making the cultural exchange between the printmaking artists of the two countries a reality. The printmaking artists from the United States invited to participate in this exhibition are currently practicing mainstream artists from higher education institutions. They are leaders and organizers in the American Printmaking Association and major international print exhibitions, presidents of universities, chairs of printmaking departments, and professors. Some are veteran artists; some are young. They represent wide geographical locations, some from the east coast, some from the west coast, and some from the inland areas. Due to the limits of time and number of participants, we could only invite 20 artists from the United States, but without doubt the artists and their works of art are representative of American printmaking artists and art. That their works of art are shown together with those of practicing Chinese printmaking artists will greatly promote exchange and understanding between printmakers of the east and west, enriching the language of printmaking, extending its vision, and breathing a new spirit into contemporary printmaking as an art form. It is an exhibition of great significance. 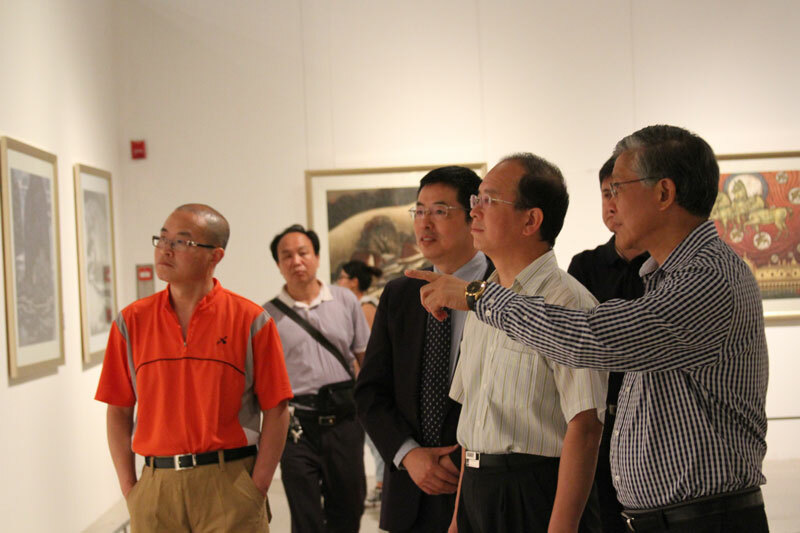 I would like to express my sincere thanks to our host, to Mr. Jun Guang, dean of the Printmaking Academy of China National Academy of Painting, Mr. Daquan Dai, associate dean of the Printmaking Academy of China National Academy of Painting for organizing the program, and to Mr. Guirong Luo, vice president of Ningxia Artists Association for his curatorial work for the exhibition. It is a great pleasure for us at the Center for Chinese Art at William Paterson University to be given this great opportunity to participate in and sponsor the exhibition. I wish it great success. I am very happy for the successful opening of the Perception and Vision: Chinese-American Art Faculty Exhibition and Symposium in the multicultural environment of the 9th China-ASEAN Education Cooperation Week, and in Guizhou, the province of diverse ethnicities. I want to express my sincere thanks to China International Cultural Association, Chinese-American Art Faculty Association, Guizhou Minzu University, and William Paterson University of New Jersey, for their co-hosting of this art exhibition and the symposium. 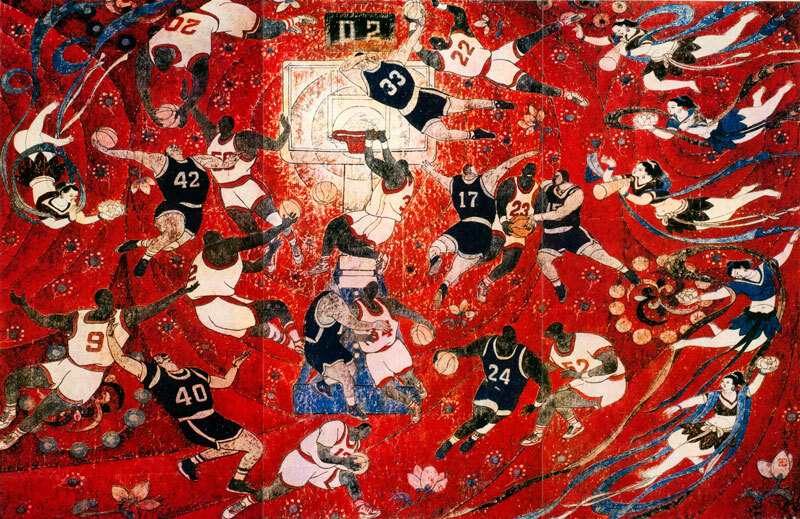 Perception and Vision: Chinese-American Art Faculty Exhibition and Symposium is the fourth major event we’ve held in the past few years with a focus on Chinese-American Art Faculty and their art works. The symposium, Imagination and Expression: the Comparison and Dialogue of Visual Art in Higher Education between China and the United States, held in the fall of 2013 at William Paterson University in New Jersey, focused on the comparison of East-West art education. 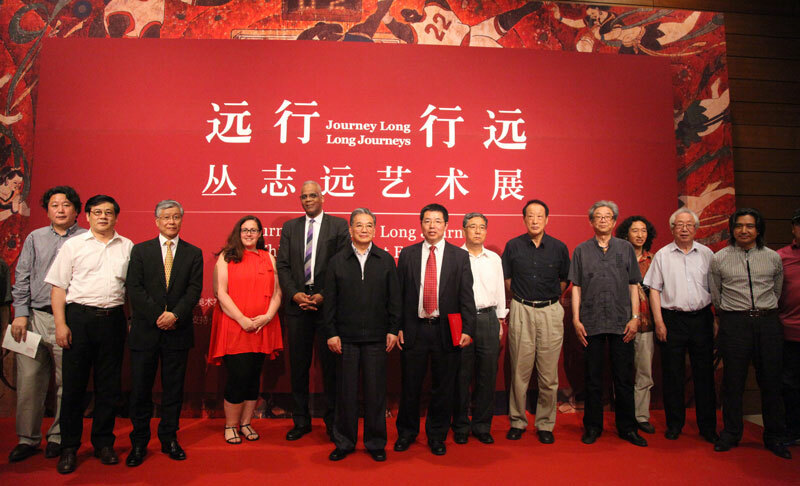 The summer 2014 symposium, Collision and Confluence: Art Administration in China and the United States, co-sponsored by the Chinese-American Art Faculty Association of the USA and the Shanghai William Chinese Art Foundation, highlighted the theme of Sino-US art administration, communication and exchange. In winter of 2014, we held the Collision and Confluence: Chinese-American Art Faculty Exhibition and Symposium, with the Center for Chinese Art at William Paterson University; Asian Cultural Center of New York; and China International Cultural Association as co-organizers, and with the theme of assimilation and mutual inspiration. And the theme of this year is to examine the survival, inclusion, enrichment and development of art in the new multiethnic and multicultural era of diversity and from the unique perception and vision of the special artist group of the Chinese-American Art Faculty. Because of these unique features, this group of cross-cultural Chinese artists and scholars who live in the dual context of east-west art are not limited to a single perspective of the west or China, nor to a self-contained point of view of the past or the present. Instead, they share a multidimensional perspective that embraces the west and China, the past, the present and the future. It’s a comprehensive vision that is crossing the boundaries, a vision that is more inclusive, more discerning and more critical in the complexity of modern society. It is a vision more conducive to our future art creation and education, to the reform of our future art education infrastructure, and to the sustainability of our current art education system. For all these, and their perception and vision, we are gathered here for this momentous art exhibition and symposium. It is our sincere hope that this exhibition and symposium will serve not only as a forum of exchange with our Chinese colleagues in art and art education, especially with colleagues from Guizhou Province and with guests from ASEAN countries, where we share our international perception and vision, our thoughts, experiences, and achievements in art research and art creation, but also as an invaluable opportunity to promote understanding, development and communication between east and west art and cultures. As Director of the Center for Chinese Art at William Paterson University of New Jersey, USA, I would like to express my sincere thanks to President Kathleen Waldron, Provost and Senior Vice President Warren Sandmann, Vice President Pamela Ferguson, for their support and care, to Professor Daryl Joseph Moore, Dean of College of the Arts and Communication for his direct leadership and participation. I would also like to extend my sincere thanks in particular to the founders of the Center for Chinese Art, the honorary Directors Madam Margaret Lam and Mr. David Yen, for the establishment of and the sponsorship to the Award of Excellence for Chinese-American Art Professors, to the honorary Directors Mr. Yong Liu, Madam Qing Rao, Mr. Zhipeng Ding, and Mr. Shengzhan Ding and their Shanghai William Chinese Art Foundation. Without their encouragement, their guidance, their support or their sponsorship, there would have been no Center for Chinese Art, nor today’s art exhibition and symposium. I wish great success to our art exhibition and symposium. For more information about this event, please call the Center for Chinese at William Paterson University at 973.720.2799 or email: ccart@wpunj.edu. 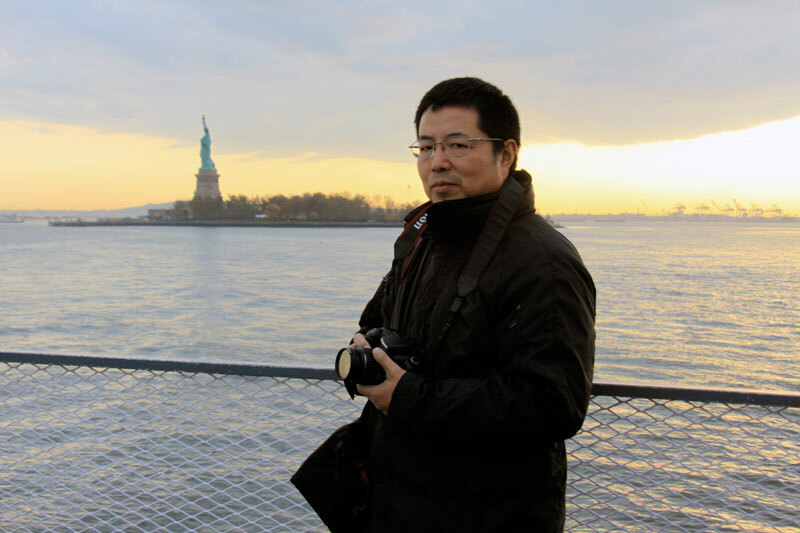 Jiawei Gong is a digital media artist and an art professor of Texas Tech University. In the past 20 years, Gong has practiced in both applied and fine art disciplines. His exhibition record to date includes over 70 group and solo exhibitions regionally, nationally and internationally in the U.S., Europe, and China. He has won a number of awards at the international film festivals and art competitions. The artworks presented in this exhibition are selected from the ART series, a body of work that Gong has been developing for over 10 years. These works address issues surrounding the systematization and institutionalization of art making throughout human history, and the similarities of this pursuit across different cultures. The ART series consists of digital compositions, interactive installations, and online games. Highlighted in this exhibition, the digital compositions are reminiscence of traditional painting, illustration, prints, and photography. Location: Ben Shahn Visual Art Center B-222. Organizers and Sponsors by Center for Chinese Art at William Paterson University, the Department of Art, and the College of Arts and Communication. Under the leadership of Professor Zhiyuan Cong, Founding Director of the Center for Chinese Art and Professor Lauren Razzore, Chair of our Visual Arts program, twenty William Paterson University students documented their recent journey to China as participants in the 2015 “Summer Arts in China Study Abroad Program” — through the universal medium of photography. Students traversed the cultural capitals of the “Middle Kingdom” visiting Shanghai, Guiyang, Chengdu and Beijing, experiencing extraordinary opportunities of engagement with artist, visiting provincial and national museums, universities and other cultural institutions. These experiences transcended urban and rural environments providing meaningful interaction with China’s ethnic minorities in areas with ancient landscapes that included villages, monasteries and Buddhist temples. This exhibition celebrates and highlights the fruit of those life-changing experiences through the Fine Art of Photography. The ancient towns and villages of China are alive with an atmosphere of peace, tranquility and purity that reflect a harmonious cohabitation of man and nature, where the most ordinary country people live. They carry on a lifestyle of their ancestors, full of inherited wisdom, traditional culture and values. It is the spiritual homeland of the Chinese. It is also a place where conflicts arise between tradition and modernity, between art and science, and between conservatism and innovation, due, to a great extent, to the speed of social development. Mr. Kemin Dong, Director of Chinese Ancient Town Institute in Xian, China, directs his professional attention towards these ancient towns and villages with his camera, capturing the vanishing structures and lives of people, recording the endangered history and emerging society at the same time, in a “down to earth” fashion. In the past 17 years, he has visited more than 200 of his beloved towns and villages and has taken tens of thousands of photographs of them, all reflecting his professional persistence, creative sincerity and inspiring perception, They are a feast for our imagination. Mr. Dong’s photographs have been selected by national exhibitions and received numerous excellence and golden awards. He was awarded excellence in photography by Chinese National Academy of Arts, by China Art Photography Society, and by Chinese Photographers, the top Chinese photography magazine. On display here in this exhibition are 26 works of photography by Mr. Kemin Dong. Mr. Jie Ding, China oil painter, “China stamp albums” art design advisor. He was a professor at Nantong University, China. Jie Ding graduated from Nanjing Arts Institute, and also acquired his master degree from Central Academy of Fine Art, China. His work has been exhibited in China, U.S., Italy, Singapore, Hong Kong, etc, and also has been selected by national level exhibitions and albums, awarded the recognition award three times. Location: CCART, 100 Ben Shahn Visual Art Center. This exhibition is organized by the Center for Chinese Art at William Paterson University, the Printmaking Academic Committee of the National Artists Association of China, and in collaboration with the Riverside Gallery of New Jersey. "This “Gathering” of the talented contemporary printmaking artists from the middle kingdom is but another gift to the west, and to that end and provides clear validation that the evolution of the medium, humbly spoken of here, is alive and well represented by these outstanding individuals as evidenced on this exhibition." For more information about this event, please call the Center for Chinese at William Paterson University at 973.720.2799, email ccart@wpunj.edu, or Call Riverside Gallery at 201.488.3005, email riversidegallery@usa.com. 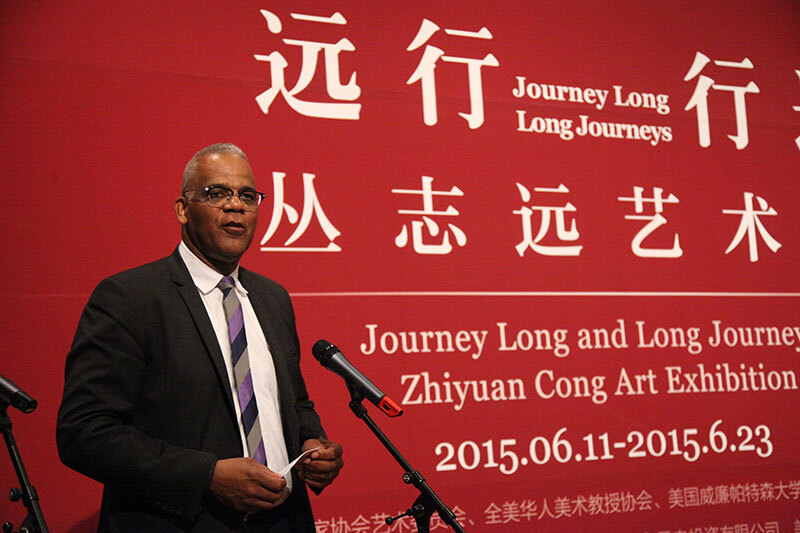 This is Professor Zhiyuan Cong’s traveling exhibition, which is hosted by the National Museum of China, William Paterson University, the National Artist Association Art committee and Chinese-American Art Faculty Association in June 2015. This exhibition show more than 80 pieces of paintings, which demonstrate Cong’s creative efforts and experiments through the years, from traditional to modern, Oriental to Western. 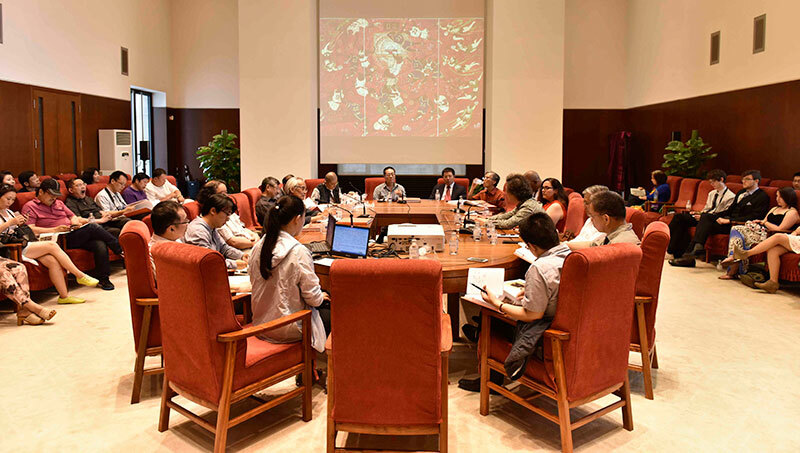 Organized by the Art Committee of National Artist Association of China, Chinese–American Art Faculty Association, William Paterson University, supported by Chinese Painting Institute of Jiangsu Province, and advised by China National Academy of Painting. "This exhibition is the culmination and celebration of artistic growth, exploration and expression spanning three decades, thoughtfully curated by Chen Lusheng – artist, author and assistant director of the National Museum of China. It is a testament to his wisdom and recognition of Zhiyuan Cong’s relevance to the land of his birth as well as the bridge that represents his transcendent journey between America and the amazing 5,000 year-old culture of China. His place in the canon of contemporary artists whose ambition and drive moved them beyond the familiar confines of the Middle Kingdom to experience success on both continents is secure — validating his leadership in the advancement of the arts as well as China’s crucial place in that advancement. That leadership is manifest in his position as founding director of the Center for Chinese Art at William Paterson University in Wayne, New Jersey, the first center of its kind on a state university campus in the United States. Additionally, he has achieved the rank of full professor and is the coordinator of the printmaking area in the College of the Arts and Communication’s Visual Arts department, admired by his peers and sought after as a teacher in our progressive academic programs." Organized by The Center for Chinese Art at William Paterson University, the University Gallery, and Shanghai Liu Haisu Art Museum of China. For more information about this event, or about the Center for Chinese Art, please call the Center at 973.720.2799 or email ccart@wpunj.edu. Organized by the Center for Chinese Art at William Paterson University, Shanghai Liu Haisu Art Museum of China and Riverside Gallery in New Jersey, this exhibition includes forty watercolors paintings by China's most famous watercolor painters, in the collection of the Liu Haisu Art Museum in Shanghai. The visual language of the collection is diverse, with themes encompassing landscape, as well as figurative and still life. The artistic expression of the exhibition utilizes realism, abstraction, as well as traditional and contemporary modalities with a fresh, colorful and elegant style executed passionately by each artist. Bringing the collection to the New York/New Jersey Metropolitan area promotes the international exchange of arts between China and the United States, and highlights the beauty of watercolor, the first western form of painting (media) used in China. For more information about this event, please call the Center for Chinese Art at William Paterson University at 973.720.2799 or email ccart@wpunj.edu.